An angel in a wheelchair came to the Trail of Hope today. I am a volunteer at the Trail, and have witnessed so many transformations and people finding healing and hope there. I was privileged to meet Leigh Ann Henry to- day, who with Jim Tuscher, is what the garden is all about. When Leigh Ann and her father Rich's van pulled up to the Trail, I wasn't sure what to expect. I greeted Leigh Ann's father as he went about getting her wheelchair from the back of the van. It was very moving to see him bend down, and lovingly take her in his arms so he could pick her up, and put her in her chair. So many times we hear about a mother's devotion, but he is just as devoted to her. He was making sure she was comfort- able in every way, as well as encouraging her to engage in conversation. I can only imagine the toll it is taking on his back as he con- tinues to pick her up and carry her that way. He would take his hand, and put it by her face, and she would kiss it. I have taken care of someone for years in a wheelchair, and know it does require a very strong commitment to be there everyday and night to do everything they can't. We are sorrowful for the hopes and dreams that they had, but trying to always be posi- tive for the life they still have. I couldn't help but reach down and hug her. I kissed her on the cheek, and she tried to do the same. 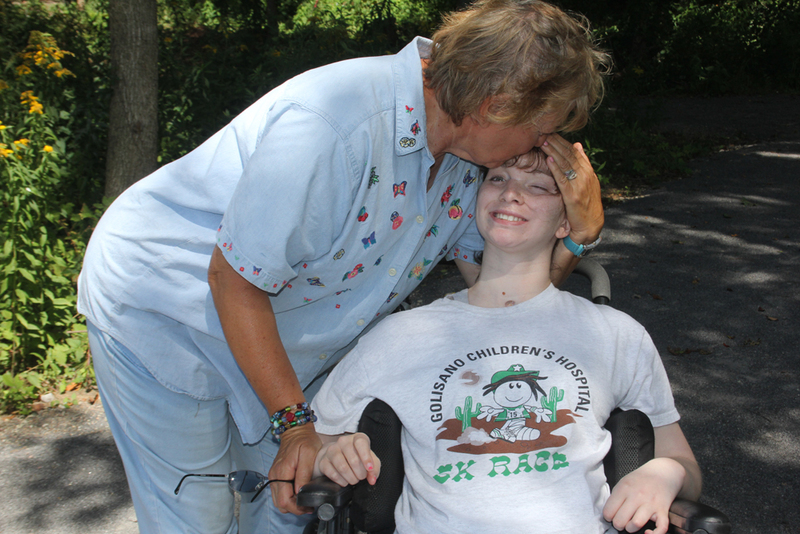 We looked in each other's eyes, and I felt I could look into her soul--a beautiful angel in a wheelchair. I couldn't help it--the tears flowed down my cheeks. A woman with dreams of her own, too soon taken away. She was a nurse to be there for others, but now she has to have others wait on her. I know she is positive, and the family is trying to do everything on their own, but how wonderful it would be if the community would come together to help her get a power wheelchair. I know we all take the ability to care for ourselves for granted, but what if we could help her live a more independent life with dignity and respect, so she could have some of the freedom that we have every day. She was a nurse to be there for everyone who was in her care, and now we should be there for her. 0 Comments to "An Angel in a Wheelchair "